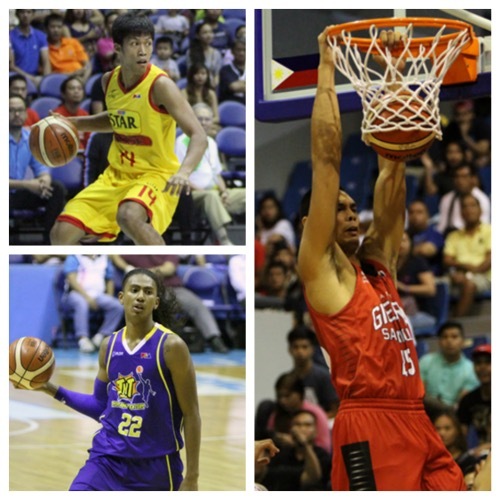 Ginebra, Star, and Talk N Text all strengthened their bids for the quarterfinals after they all notched separate wins this weekend in the 2015-2016 PBA Philippine Cup. The Barangay Ginebra San Miguel Kings got a huge offensive night from Greg Slaughter but needed some timely contribution from guards LA Tenorio and Scottie Thompson to finally put away a pesky Blackwater team after two overtime periods, 102-94, in an out-of-town game at the AUF Sports and Cultural Center in Angeles, Pampanga. Slaughter finished with 35 points, 15 rebounds and four assists. He shot 15-for-21 (71%) from the field in an efficient performance for Ginebra. But it was Tenorio and Thompson that came up biggest when Ginebra needed it as both knocked down crucial three-pointers in the second overtime that gave the Kings the difference it needed to notch their fifth win in nine SMART BRO PBA Philippine Cup games. 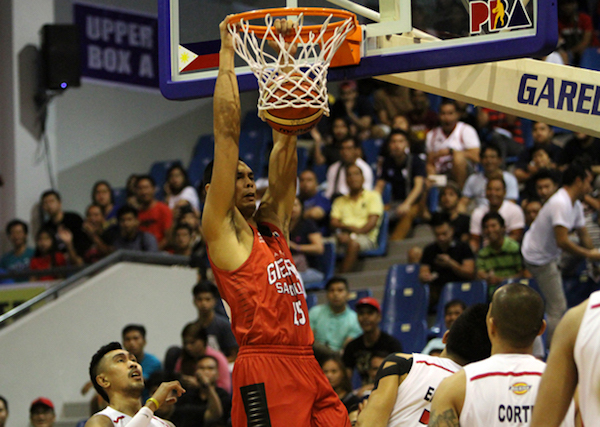 Japeth Aguilar added 25 points, seven rebounds and three blocks in a strong showing, while Tenorio finished with 19 markers. With the win, Ginebra moved ahead of NLEX and Barako Bull (4-4) in the standings and booked its place in the quarterfinal round. Reil Cervantes and rookie Art Dela Cruz scored 13 and 11 markers respectively to pace the Elite. Greg Slaughter (GIN) - 35pts, 15rebs, 4asts, 2blks, 15/21 FGs. 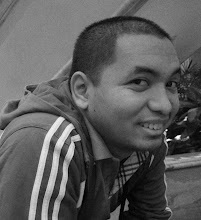 Jason Ballesteros (BLA) - 8pts, 16rebs, 2stls, 4/8 FGs. 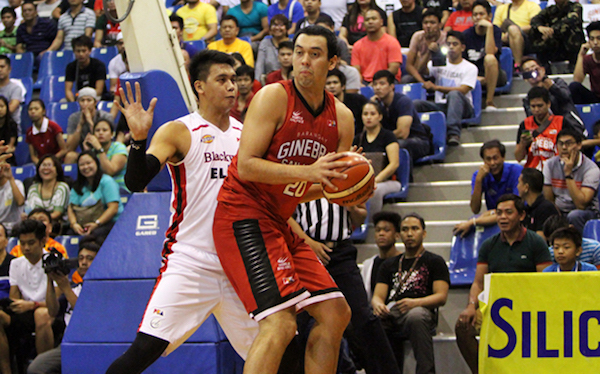 Greg Slaughter continues to dominate for the Gin Kings. Japeth Aguilar slams one home for Ginebra. 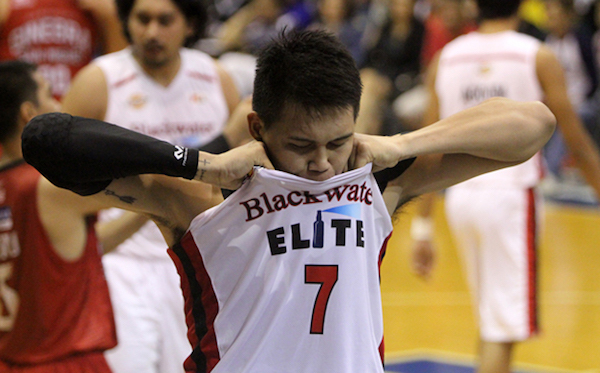 JP Erram reacts in frustration after losing to Ginebra in overtime. The Star Hotshots trounced the Mahindra Enforcers, 104-96, to snap a losing skid and also move closer to a quarterfinal ticket in the SMART BRO PBA Philippine Cup Sunday at SMART-Araneta Coliseum. Mark Barroca led the Hotshots in scoring with 26 points while he was helped by Alex Mallari who got 20 markers as Star (3-6) neared the magic number of four wins that would guarantee them a spot in the next round. 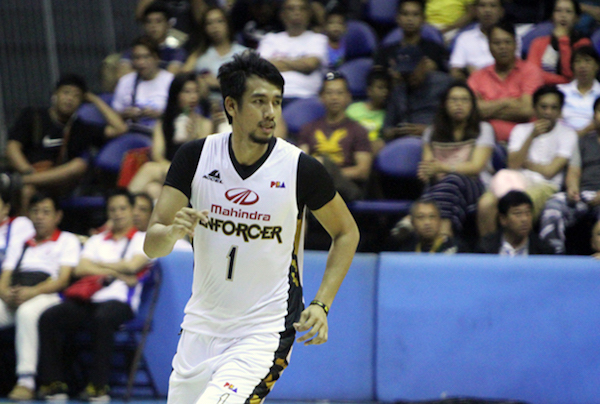 Star, which also got 15 from James Yap, also ended a four-game skid at the expense of Mahindra (2-7) which like the Hotshots are chasing one of the two remaining playoff tickets. Aldrech Ramos and Karl Dehesa did the heavy lifting for Mahindra, scoring 26 and 24 respectively but their efforts weren’t enough to topple Star. Mark Barroca (STA) - 26pts, 5rebs, 3asts, 3stls, 9/14 FGs, 4 triples. Aldrech Ramos (MAH) - 26pts, 12rebs, 1stl, 1blk, 10/14 FGs, 3 triples. Aldrech Ramos had a superb outing in the loss to Star. 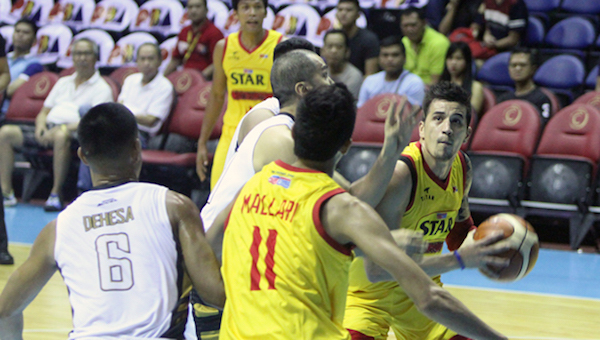 Marc Pingris tries to attack the Mahindra interior. 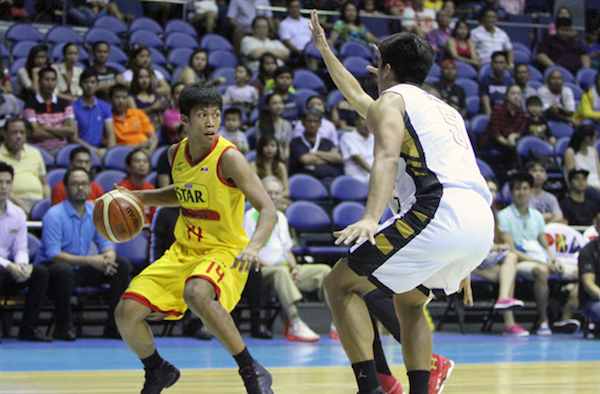 Mark Barroca led the way as the Hotshots got win #3. The Talk ‘n Text Tropang Texters took the fight out of the Rain or Shine Elasto Painters right from the very start to cruise to an easy 95-85 win in the SMART BRO PBA Philippine Cup Sunday at SMART-Araneta Coliseum. Top pick Moala Tautuaa finished with a career-high 27 points and eight boards, while second overall selection Troy Rosario recorder 19 and 11 as they led the relentless attack by Talk ‘N Text that started the game on a 17-0 blitz and never looked back. Rain or Shine, the league’s top offensive team, just struggled to convert a field goal in the first half, even missing all of its 15 triples during that juncture. The Elasto Painters never posed a threat the entire game as Talk ‘N Text improved to 5-3, good for a share of fourth place in the team standings. Jeff Chan scored 15 points for Rain or Shine that slid to 6-2 and missed a chance to grab a tie for the first spot. They also saw the end of their three-game win streak. Mo Tautuaa (TNT) - 27pts, 8rebs, 2asts, 8/14 FGs. 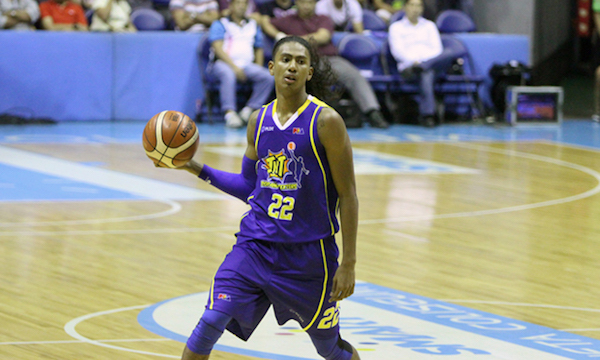 JR Quiñahan (ROS) - 21pts, 6rebs, 1ast, 2blks, 8/14 FGs. 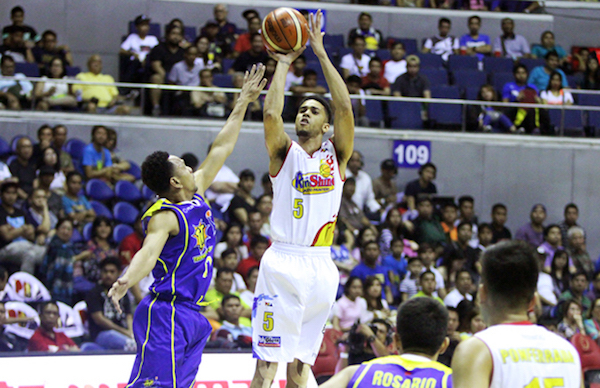 Gabe Norwood pulls up over Gilas teammate Jayson Castro. 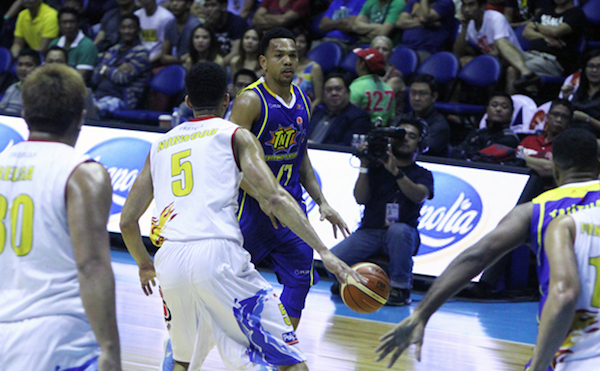 Jayson Castro sizes up the ROS defense. Matt Rosser and the Texters notched their fifth win of the conference.